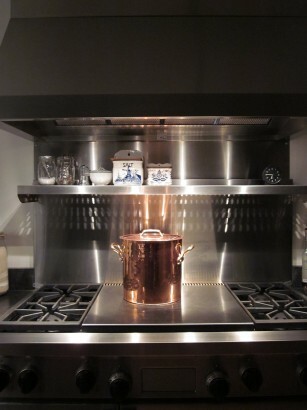 Over the years I have picked up several pieces of copper cookware from France. Several pieces have dents and dings, but that doesn’t hamper the performance. Handsomely made with a tin lining and solid brass handles, it is a joy to use on a gas flame for superb cooking and so nice to look at too. Although a fair amount of care must be exercised to control the heat to prevent literally cooking the lining, it’s worth the extra attention. I am over the notion that is has to be perfectly polished and appreciate the patina of tarnish and oxidation. My all time favorite piece is this big stockpot. When I cook a big stew I transport myself to a village kitchen in France. It makes it taste better, of course.